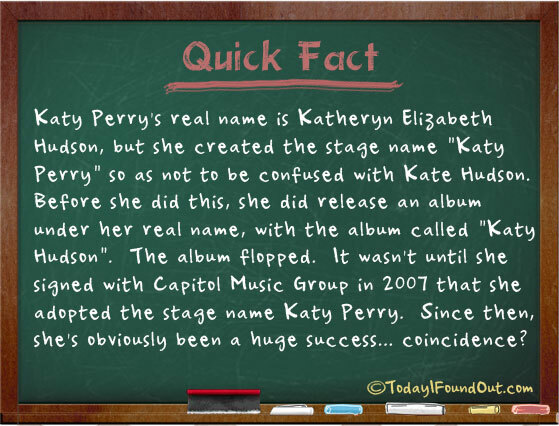 Katy Perry’s real name is Katheryn Elizabeth Hudson, but she created the stage name “Katy Perry” so as not to be confused with Kate Hudson. Before she did this, she did release an album under her real name, with the album called “Katy Hudson”. The album flopped. It wasn’t until she signed with Capitol Music Group in 2007 that she adopted the stage name Katy Perry. Since then, she’s obviously been a huge success… coincidence?!? … probably.